It seems as though I’m constantly talking about Pinterest. But since it’s consistently my #1 traffic source, it’s important to discuss. Compared to the month of November, my pageviews for December were down 32%, but as I looked at my numbers from Pinterest, they were down 50%. I did have great success with my Pumpkin Roll recipe during the month of November, but my numbers shouldn’t have gone down 50% in December. I know that the decrease is due to the new smart feed. It has me stumped so I decided to do something about it. Not only did I sign up for BoardBooster to schedule my pins but I also signed up for the Pinning Perfect Pinterest eCourse which I will start this month! I can’t wait to hear what the “experts” have to share! I recently watched How To Grow Your Facebook To 1 Million Real (Unpaid) Followers where Holly Homer is interviewed about the fabulous success she’s had with her Facebook page. While I’m not looking to grow my page to a million followers, I would like to grow it in hopes of diversifying my blog traffic (so I’m not relying on Pinterest to drive traffic). Since watching the video and applying her tips, I’ve seen consistent growth on my page. I’m no longer stressing about the numbers but am having fun. That’s what social media is all about isn’t it? My strategy: Once I week I take about an hour and schedule out my posts for the week (four per day). I head into my Insights and schedule the times of day when my fans are online. As I’m browsing around Facebook during the week I’ll save articles that I’d like to share on my page, or I’ll schedule them for a week out (and change the times when I’m doing my weekly scheduling). There are naturally times during the week that I want to share something. I’ll switch out one of the scheduled posts with the new post. As Holly suggests, commit to sticking with it for at least 6 weeks and have fun with it while getting to know your community! 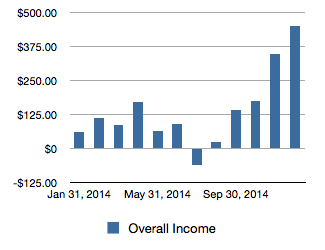 It’s been one year since I began these monthly Traffic and Income Reports. I’ve enjoyed sharing them each month and the accountability of sharing has driven me to push myself and not give up on the days that I want to. I try to keep it fun for myself by making it a game! Call me a geek, but I pulled together a graph to look at the yearly numbers. As you can see, I began the year with 36,558 pageviews, had a bit of a lull (when I learned about my surprise pregnancy) and then grew to 58,874 pageviews. 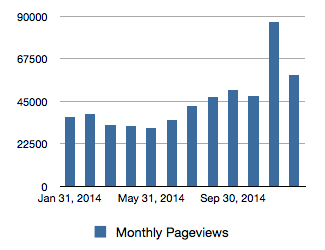 My goal for 2014 was to reach 50,000 pageviews and I’m so excited that I met (and exceeded) that goal! I’m pretty proud of how I did with my blog earnings in 2014! Considering I made $3 from Adsense in October of 2013, I’m excited at the direction I’m headed. While blogging isn’t about the income and traffic, it’s fun to track and make a bit of cash from something I enjoy so much! What do you think, should we keep going with the reports? Now it’s your turn to share! What tips and tricks do you have to share that have been working on your blog? Congratulations! You are doing a great job! The Lord is certainly blessing you Tshanina! I’m very excited to see you doing so well. I looked into the izea thing and it was hard to find information. Do you have to pay a subscription fee? Curious. There is both a free and paid option ($1 a month). The free option gives you the ability to bid on three posts a month while the paid option gives unlimited bids. For me it was a no-brainer to use the paid option. Even if I did one sponsored tweet a month it would pay for itself. Wow, thanks for sharing this. I was wondering when did you start blogging? I’d also love to hear more about how you grew your blog to over 50,000 page views. Congrats on achieving that goal! Roxanne, I started blogging in 2010 but just started taking it “seriously” and trying to make money from it in October of 2013. Although the traffic has slowed down since the smart feed, Pinterest has been my biggest traffic driver. I’ve worked hard at writing content that solves a problem for readers and also including a good quality picture that draws people in.